Football fans across New York are gearing up for Super Bowl 50. If you plan to drink during the Big Game, then be sure to arrange transportation home – because police will be out in full force looking for signs of drunk driving. A DWI charge can seriously threaten your personal and financial freedoms. According to the New York Department of Motor Vehicles, first-time offenders can face a fine of up to $1,000, as well as one year in jail. The consequences are worse for subsequent offenses, which is why you should contact a DWI attorney to discuss your defense options. At Goldberg & Allen, LLP, we understand that honest people make mistakes. We will fight aggressively for a positive outcome to your case. Depending on the facts of your arrest, there may be a defense that convinces the courts to reduce the charges or penalties, or to dismiss the case altogether. Call 212-766-3366 to schedule a consultation with a New York City DWI attorney. You can also visit www.USAttorneys.com to learn more about DWI defense strategies. If you are planning to attend a Super Bowl party at a friend’s house, make sure you appoint a designated driver to bring you home. If everybody wants to drink, then consider staying sober and volunteering to drive. If everyone in your group wants to drink, and you don’t want to be the designated driver, consider using a taxi or designated driver service. Ride-share companies, such as Uber and Lyft, can also get you home safely. If you want someone to drive you and your vehicle home, consider a service like BeMyDD. You can save money and stay safe by staying overnight at your friend’s house. One uncomfortable night on the sofa is far better than an uncomfortable night in a jail cell. Ask your host if you can stay until the morning or until you have sobered up. If you are hosting the party, tell your guests they can stay if they appear drunk or tired. Some medicines can impact your driving ability, and they may hinder your cognitive functions. In particular, sedatives and sleeping pills can land you in trouble while behind the wheel. If you are taking new medicines that may cause drowsiness, be sure to make alternate arrangements to get home. Do not drive until you are certain that the effects of the medication have worn off. 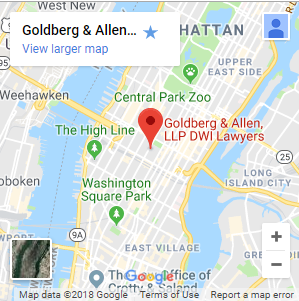 If you facing charges for DWI or DWAI-drugs in New York, contact Goldberg & Allen, LLP. A New York City DWI lawyer from our firm can gather evidence, structure your defense and aggressively fight for a positive outcome to your case. Call 212-766-3366 to schedule a consultation.